The largest statue in the world of Jesus is in Poland. The statue of Christ is 33 meters high. This represents one meter for every year of Jesus’ life. On top there are 2 additional meters as there sites a golden crown. The base of the stature is18 meters which makes the statue 51 meters in total. This out does the Jesus statue in Rio by 13 meters. It weights 27 metric tons. The location of the statue is in western Polish town of Swiebodzin which has a population of 22,000. The construction cost a 1.5 million and took five years. It was funded by donations. On one hand, the Jesus statue in Poland is built in honor of our Lord. On the other hand, some people say it is not in the spirit of humility that Jesus taught. My perspective on this as an American and Pole is this, Poland is a religious country. I often see long lines at the confessionals and churches so filled with people that people are standing outside the church. Although many people criticizes people who go to church, for going there to show up, I can tell you I know no Polish person that goes to church to show up or be seen. Not one. People go because they sincerely are trying to live a good life. Poles are very humble peaceful people for the most part. People who criticizes this want to sir up attention for media reasons than out of any understanding or sincerity. This Jesus monument is not much different from building a cathedral in honor of God. It is to make the world that the message of Jesus is still alive today. When Poland was entering the EU John Paul II stated that Poland has a lot of positive things to benefit from this Union, but also Western Europe can benefit from Poland, especially in terms of belief. And yes I think Western Europe is lacking in faith and the effects can be seen. Pilgrimages are still done in Poland like in the Middle Ages. It is not uncommon for students to visit shrines like “Our Lady of Czestochowa” over a week long pilgrimage walking there. I do not know if this statue will be a site for serious pilgrimages, I think more for tourists, or at least religious tourists, which are like pilgrims lite. However, I like it. The Polish language translation of this figure is Pomnik Chrystusa Króla – I think the literal translation is apparent. Pomnik is monument it is kind of related to the Polish word for remember which is pamiętać. 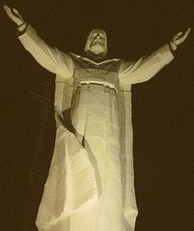 This photo was taken at night so does not do justice to the artistic power of this statue of Christ the king. You have to go there and see it for yourself. The style is modern and classical. Classical in the sense that it is proportional and clean lines. Modern in the sense that is it nothing like an ancient classic which would be more dramatic and flowing in my opinion. I think they did a good job with the construction. Let me know what your thoughts are about the worlds largest statue of Jesus in Poland. I am so pleased to read something so positive about the statue. Although I have no personal religious view, I thought it a marvelous monument to the faith of the people behind it and got quite annoyed at the number of people, including Polish clergy, who could only criticize it. It is an interesting monument. I think sometimes people like to criticize just because they are negative anyway. The statue is nice. It makes things interesting. It is better than having just a field. It was done with good intentions. Reakcje na pomnik Chrystusa są podzielone- jest wiele pozytywnych, jak i negatywnych komentarzy. Sama mam wrażenie, że został on zrobiony “na siłę”, jakby nie do końca jest dopracowany. O wiele bardziej podoba mi się pomnik w Rio. Ps. Podziwiam wszystkich uczących się polskiego- to niezwykle skomplikowany, lecz piękny język. Życzę wytrwałości i siły w nauce. Pozdrawiam. Yes, I know you feel divided. 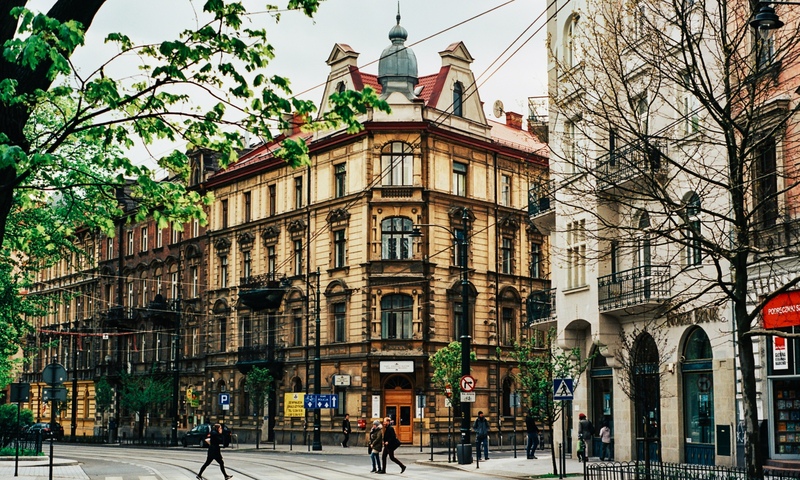 Why can Poles not just say it is nice and no big deal? 🙂 I mean I am Polish (and American) and I feel I have to make everything so complicated. It is a nice statue of Jesus. You are right Polish is a beautiful language and I admire people who have mastered it.